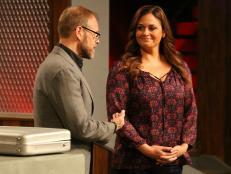 Watch the latest installment of Alton's After-Show to see the host dish with tonight's judge, Antonia Lofaso. 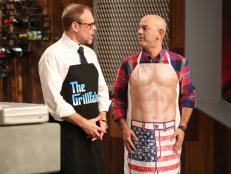 Alton reveals the sabotages for bacon-wrapped dishes, lasagna and cookies. 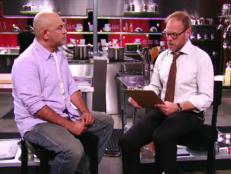 No matter chefs' culinary skill levels or the amount of time they've prepared for competition, nothing can ready them for battle on Cutthroat Kitchen. Combined with the fierce time constraints in any given round, the unruly sabotages doled upon them practically guarantee they must reimagine any preconceived ideas about their dish and simply attempt to finish on time. 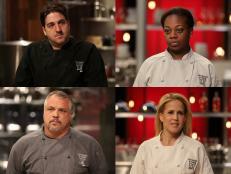 For many finalists, however, the only way to complete the round is to offer a deconstructed version of their dish, featuring just its parts, which when combined, may make up a whole. Such a maneuver is risky, as judges — especially seasoned ones like Antonia Lofaso, Jet Tila and Simon Majumdar — can see past a chef's mention of purposely deconstructing a dish and realize that it's likely a last-ditch effort to plate his or her food. On tonight's all-new episode, Chef Jenny was faced with a doozy of a sabotage that landed her in a racecar seat, so her ability to cook quickly was compromised. And much to the judge's horror, Chef Jenny told Antonia that her lasagna was "deconstructed." Antonia explained of her reaction to Alton Brown on the host's After-Show, "I almost can't take it seriously when they say 'deconstructed' to me anymore." Alton added, "Because nobody actually does it unless they're in trouble." Antonia said of Chef Jenny sarcastically, "She's like, 'Oh, I really meant to just throw the noodle down the center and put some raw tomato on it with a dollop of ricotta.'" Ultimately the curse of the deconstructed dish struck again: Chef Jenny said goodbye after the lasagna round. Click the play button on the video above to hear more from Antonia and Alton, then catch up on more After-Show commentary on FN Dish. 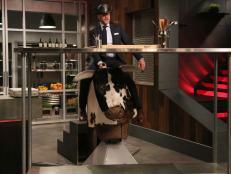 Tune in to Cutthroat Kitchen next Sunday at 10|9c. 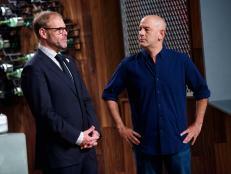 Watch the tenth episode of Cutthroat Kitchen: Alton's After-Show, hosted by Food Network's Alton Brown. 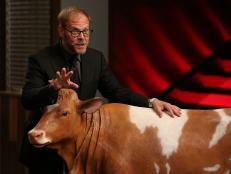 Watch the eighth episode of Cutthroat Kitchen: Alton's After-Show, hosted by Food Network's Alton Brown. When both Round 3 dishes contained flaw, it was up to judge Simon to consider more than just granola bars to decide the winner. 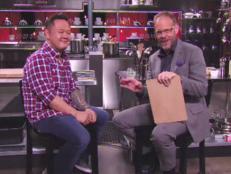 Watch the thirteenth episode of Cutthroat Kitchen: Alton's After-Show, hosted by Food Network's Alton Brown.